Maria Garcia Juarez wandered around the international arrivals area at Detroit Metropolitan Airport on Friday, frantically looking for a government official who held a sheet of paper with her fate written on it. As she scurried from one Delta Air Lines security employee to the next, asking if anyone had seen agents from Immigration and Customs Enforcement, Juarez looked like a woman tortured by twin emotions: the hope of staying in the United States to help her husband survive a stem cell transplant and care for their toddler son, and the fear of being deported from her family and the only country she’s known since she was eight months-old. Juarez was born in the Mexico and for years has faced deportation for stealing two cars as a juvenile while growing up in gang-filled Salinas, California. She’s now 23, lives in Detroit and is among an increasing number of undocumented immigrants in Michigan facing deportation since Donald Trump was elected president amid promises to remove “bad hombres,” or undocumented immigrants who had committed crimes in the U.S.
Juarez filed several appeals based on special circumstances in her drama-filled immigration case, including having an American husband who’s battling cancer. 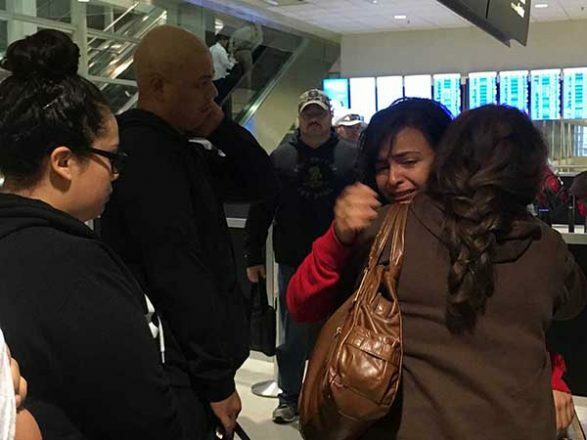 She was at the airport early Friday because she was scheduled to be deported to Mexico. She had booked a flight for that morning, but hoped she would be able to stay because of an appeal she’d filed the day before. An immigration agent held the results of the appeal. But Juarez had no idea what the agent would look like or who to look for. “I don’t know what to do,” she said, standing in the middle of a crowd of early-morning commuters. Seconds later, a tall man wearing a backpack and navy blue polo shirt that concealed a bulge on his right hip approached Juarez and her small entourage of relatives. The strap that held the badge around his neck read “ICE.” He escorted her to the ticket counter. Panic and tears flashed across Juarez’s eyes at the sight of the ticket counter. Grabbing her forehead, she explained to the ICE agent that she was looking for the decision documentation on her appeal. A man stepped forward wearing a camouflage baseball cap, jeans and a black hoodie. He’d been waiting at least a half hour before Juarez’s arrival. He pulled a sheet of paper out of a manila envelope and handed it over. Juarez’s five relatives, including husband, Erick Orozco, gathered around it. Juarez read the paper silently and nodded. Marisela Lopez, Juarez’s mother-in-law, yelped, asking in a flurry of Spanish what was going on. Juarez, eyes pooling with tears, let the paper fall into her mother-in-law’s anxious hands. Juarez’s last request to remain in America was denied, the document read. This is what it looks like to get deported. Immigration officials told Juarez this day was coming in June 2016. Juarez was brought illegally to the United States by her mother when she was an infant. In 2011, she led police on a high-speed chase in stolen car in California and was sent to a detention center in Virginia to face deportation based on her juvenile record. She came to Michigan in 2012, on her 18th birthday, to live with relatives who hired a lawyer to fight her deportation. With an unshakeable hope that the immigration officials would use their discretion to allow her to stay in America, she filed appeal after appeal. She asked for political amnesty, but was denied last year. The attorney who filed that case was sentenced to prison earlier this month for bribing immigration officials to benefit other clients. In January, shortly after Juarez’s husband was stricken with a second bout of leukemia, she appealed to stay in America because her removal would cause a hardship for her spouse, who is an American citizen. She argued that she is no longer the teen who was hooked on meth and stole cars. After moving to Detroit, Juarez said she got clean, earned a diploma, took college courses and worked a job as an administrative assistant in a chiropractor’s office. Even though she is married to a U.S. citizen, she was not eligible to apply for permanent residency while in the U.S. because she had entered the country without a visa. In April, ICE told her she had to leave by the end of May and locked a tether on her ankle to keep track of her. Then with only days until deportation, she found and hired a new lawyer, Brad Thomson, owner of the Immigration Law firm in Ann Arbor. The day before she was scheduled to be deported, she and Thomson went to ICE to request an emergency delay on her removal while she applied for the Deferred Action for Childhood Arrivals program. It allows undocumented immigrants who are brought to America as children protection from removal for a renewable period of time. None of her handful of prior lawyers had suggested she apply for DACA because they were skeptical that she would get it due to her juvenile record and having been labeled – wrongly, she says – a gang member. However, Thomson said the law would allow immigration officials the discretion to grant her DACA status because her juvenile record does not automatically mean she must be removed. She had nothing to lose by filing the applications, and months or maybe even a lifetime in America to gain, Thomson said. The appeal was enough to send Juarez to her deportation date at the airport with a nervous hope heavy in her chest. Juarez knew she was pinning her hopes against a harsh reality: ICE may not consider Juarez to be a threat to U.S. security, however, under the Trump Administration, ICE is no longer making nuanced decisions about the removal of undocumented immigrants based on the relative seriousness of their crimes. The law often allows immigration officials to use their discretion to determine who should be removed, but in today’s political climate there’s little room for discretion, Thomson and other immigration lawyers said. Deportations in Michigan and Ohio, the areas served by the Detroit-based ICE office, are on track to exceed last year’s numbers. From Oct. 1 to April 8, 1,475 immigrants were deported, including 759 with criminal records. In the prior year, 2,056 people were deported including 1,331 criminals. Of the estimated 11 million undocumented immigrants in the U.S., about 126,000 live in Michigan, according to the Partnership for a New American Economy, a pro-immigration initiative. Thomson said he’s seen the rate of deportations increase in recent months and the new administration’s policy, he said, does not take into account the impact deportations have on families. Instead, Thomson said it is politically expedient now to crack down on all undocumented immigrants, especially those who come from the other side of the border where Trump wants to build a wall between Mexico and America. “It sells to the general population,” Thomson said. When Maria got on the plane Friday, she was barred from applying to enter the United States for 10 years because she had been in the country undocumented for more than a year past her 18th birthday. Her best hope of returning would be to file for a waiver – a process that could take anywhere from months to years. And even that process would lead officials back to her juvenile case, Thomson said. Her more imminent problem is that she is foreign to Mexico and could be preyed upon by gangs or thieves who would assume she is an American with money, Thomson said. Juarez said her hope to stay in America haunted her the past few weeks. She hoped to stay at least until her husband has his stem cell transplant, which is unscheduled but could be this year. On the day before she faced deportation, Juarez found out from doctors that her 18-month-old son, David, has a speech delay that will require therapy. A chance to stay would be a chance to hear him speak his first words, she hoped. And her hope was contagious. The family gathered at Juarez’s sister’s house the day before deportation. They ate posole and talked until the wee hours of the morning before heading out to the airport. Juarez left her son at home with her brother’s fiance. When they arrived at the airport, even her relatives – her husband, mother-in-law, a sister, a brother, and a brother-in-law – huddled around the ICE document still hoping it would grant her permission to stay. Their hope persisted even though her other two appeals were denied and President Trump has repeatedly stated that undocumented immigrants should return to Mexico. Lopez, Juarez’s mother-in-law, stared at the denial letter after the ICE agents escorted Juarez away. Numb with disbelief, she said she was seeing the words, but having a hard time processing their import. After Juarez hugged each relative – her husband twice – the ICE agents escorted her through airport security where she was allowed to cut to the front of the line where dozens waited to go through metal detectors. Every few steps, she glanced back at her family, which craned their necks to see her through the crowd from the other side. Her face appeared to grow pinker from crying harder with every step. Juarez had only a carry-on duffel bag and a purse, not the volume of luggage of a person expecting to leave for good. Two days ago, she had talked to an uncle who was supposed to pick her up when she landed in Mexico, to take her to his home outside of Guadalajara. Erick Orozco, her husband, said few words during the whole exchange. When would he be well enough to go visit? How will she fare in Mexico? How will he fare without her?